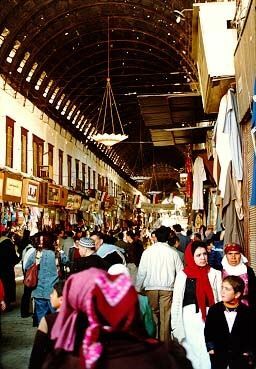 The covered Suq al Hamidiyeh in Damascus. The street is part of a grid including the famous Street Called Straight, a few blocks to the south. The roof, supported on iron ribs, ends at the Umayyad Mosque, much as Jerusalem's Suq al Qattanin ends at the enclosure of the Aqsa Mosque.